We had wee bit of money sitting in the bank, earning paltry interest on account of the ever-diminishing benchmark rates, and of course we couldn't invest it - what with the world economy going to hell in a hellcart and all - so we spent long hours debating what to do about it until I came up with (immodest, I know) a brilliant idea: let's give it to my dentist, I said, and proceeded to make the requisite appointment. The negotiations were swift - I wish I could say painless - and the good man agreed to take the savings plus a good chunk of our future earnings, in exchange for the privilege of being let loose in my mouth with drills, hammers and other heavy machinery. Problem solved. Yes, dear readers, I have bad teeth. I used to blame the weak enamel, for that was the explanation given to me by my first dentist, a chap who must be spending his retirement on a private island with money raised largely through my parents' contributions. Then when I was in the civil service I took a resident of the place where I worked to meet a free hospital dentist who didn't believe in cavities. "Explain," said I. And he: "The tooth decay, it's got nothing to do with bacteria: it's bad alignment in the teeth that leads to faulty chewing, and the irregular vibrations cause the teeth to decay." I found the theory a little suspect, but either way weak enamel, badly aligned teeth - I was off the hook. Until the other day, that is, when I was due to visit the hygienist at my dental practice. Like all hygienists, she'd obviously attended Stern School, where I'm sure she graduated at the very top of her class. But in spite of her brisk manner, I hereby pledge to always hold this good woman close to my heart, because she told me how to brush my damn teeth. None of her colleagues - and I've met a few in my time - had ever done that. I spent my life thinking I was doing it right. Up and down and left and right and in and out, spending a good amount of time on each area. I remember this American chick in the Colgate ads when I was a child: she did the up and down thing, I swear, and then she bit an apple to show off her powerful and impossibly white incisors. Well, according to my hygienist, YOU SHOULD NEVER BRUSH IN AN UPWARDS AND DOWNWARDS MOTION. Nor left to right or right to left. You're supposed to proceed in circular movements, and brush your gums as well. I never brushed my gums in my entire life. I've been doing it all wrong. I might as well have not bothered. It's quite possible in fact that I made things worse, by shoving tiny particles of food in un-rinseable places. I'd estimate that I started brushing regularly when I was three and a half. Morning and night, for an average of, say, six minutes per day. I'm now thirty-seven and a half. There are three hundred and sixty five days in a year, twelve thousand four hundred and ten days in thirty-four years, plus eight more on account of the bi-sextiles. Times six, that makes seventy-four thousand five hundred and eight minutes, which is to say twelve hundred-odd hours, which is to say almost fifty-two days. When I die, I want those deducted from my tombstone - they should in no way count as "life". So, let me ask you, dear readers: am I the only person who wasn't told about this? Did I miss a crucial day at preschool, a visit by the district nurse? Or is this indispensable tip for personal maintenance in fact a half-secret, something that is sporadically passed on by hygienist to blogger when it should in fact be oft-repeated on TV and attached to the phone book and stapled to Gideon bibles to ensure maximum penetration among the populace? In DeLillo's satire of the postmodern condition, it is the din of information the makes people forgetful of the basic rules for taking care of oneself, of life's user manual. It's a culturally induced amnesia whereby the mind's capacity to store information is entirely exhausted by trivia and factoids, leaving the characters gasping for intelligent thought. Another bringing up to date of Plato's lesson? Yes, but consider also the parallels with Leonard's condition in Memento, the erosion of the self caused by the inability to sustain a complex personal narrative, make sense of the world and other people. 'Forgetfulness,' says Jack Gladney in the novel, 'has gotten into the air and water. It's entered the food chain' (p. 52). No longer the individual affliction of Plato's solitary reader, whose learning was desocialised by the technology of the book, or of trauma victim Leonard Shelby, amnesia becomes in DeLillo a social illness, something you can catch and pass on to others. Feel free at this point to keep metaphorising along the lines of the computer virus, and to wonder whether the Internet is in fact the ideal place to spread such a contagion - a suggestive image that might be worthy of a little pause. I am not drawing that conclusion myself (not yet anyway), nor suggesting that the solution to the problem is to return to earlier ways, more traditional authorities, fewer voices, less technology and a quieter culture. The solution I envisage, the vaccine if you like, consists rather of a more nuanced understanding of the social modes of remembering, greater economy of expression, better cultural and technical tools to navigate information and produce knowledge - in short, a new ecology of memory. It is a recipe that I'll keep repeating and refining, defining, redefining, as I learn to come to terms with the blog-form and its lack of a clear reading path, of premises and conclusions - a text continually written and always approached from its latest page. But I am conscious that I may not have convinced anybody thus far that there even is a problem, an actual breakdown in the transmission of memory, as opposed to fashionable musings and the complaints of those who fear or resist our current reconfigurations. And fair enough, I'm mostly mapping out an imaginary after all, and the connections to the real world have not been forcefully made, yet. One thing I can tell you with some confidence, though: you should always use a soft-bristled toothbrush. My hygienist reckons they shouldn't even sell any other kind. Don DeLillo. 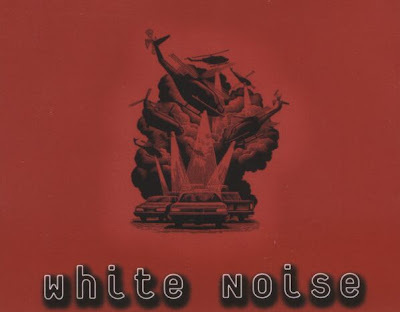 White Noise. New York: Viking, 1985. The Simpsons: You Kent Always Get What You Want (2007). I too have been the way of the dentist and hygienist. I have bought a computerised 'lectric toothbrushism that times my brushing (2 mins) wirelessly to a clock...this is no life for a poet. Indeed, but: do you have Scrabble in the house? A much more fitting tool for a poet would be the little two-minute hourglass. The old sand technology, you know. Which also happens to be wireless. Actually, we did get some sort of lesson at school - I remember it. Unfortunately, we were taught up and down. Evidently fashions in toothbrushing change. However I have fabulous teeth, and spend very little on dentistry. I attribute this to fluoridated water, good genes, and lack of a sweet tooth. Good luck, in other words. Some years ago I did volunteer work for a halfway house whose mission was to help teenagers that had been a mental ward back into the world. It was amazing, and very sad, how many had never ever been taught such basic things is "wash yourself every day", "eat vegetables", "if you wear the same clothes every day they will get dirty and smell." It turns out that bad parents (and many of them did have bad parents) fall down in every department, not merely abuse. There is a special rung in Dante's Inferno for the people who utter that particular sentence. Although I suppose they're circles, not rungs. I sometimes gargle with chocolate mousse. Do you think it's bad? Ah, the brushing lessons at school, it brings me back. Mine must have been in grade 4 or 5, but I clearly remember the aftermath. They told us to brush only down, not up and down, just down and for 6 minutes straight. That very night my parents were going out and employed an eager baby sitter, who must have been sixteen years old or so. The time to go bed came and I headed for the bathroom, armed with my watch. I proceeded to brush my teeth for exactly six minutes, an eternity by any standard, and I clearly remembered the more and more aggravated face of the sitter that didn't know if to reprimand me because I wouldn't stop and go to bed. In the end she waited, since I was doing something any good boy should do, brushing my teeth. Needlessly to say, that was the first and last time I brushed for that long, now if I go for two minutes it's an accomplishments. I still wonder if all my cavities over the years are due to those missing minutes. Giovanni: “Life: A User's Manual” is one of my all-time favorite books as well. Just magnificient. Help me remember: was there something in Life about brushing? Or is it in another one of his books? I have to find it or it will kill me. You mean you don't floss? "Absolutely. All the time. I go to the floss store and they're like, "Whoa, there he is again." 'Cause I buy so much floss." I meant downward on the top teeth and upward on the bottom teeth. The guy was adamant though, not up and down in a continuos motion: for the top teeth go down, detach the brush, move it back up, reattach it to the top of the teeth and move down again. Viceversa for the bottom teeth. Sorry, can't remember if teeth are involved in the book. I should probably re-read one of these decades. Here is a true story of toothy troubles from two years ago. The ones that are not mine are quite macabre; caveat lector. The dentist and t.he hygienist got into quite a conversation, while tending my teeth, about some of the more interesting things they’ve seen. This should be illegal. But I'm prepared to accept that tales of international dentistry would be interesting, provided one isn't sitting on the chair. During my last trip to Italy I discovered that a practice that had been widespread for a number of years - people going to Eastern Europe to save money on dental treatment - has generated a very interesting and canny industry. The most widely advertised company is called Holident and promises fabulous trips to Prague with complimentary root canal. Apparently these trips are also back in time, insofar as you get to experience some techniques that have been abandoned in the West. Had my 3rd and final dentist visit yesterday, yes birthday day. Had old dentist for 33 years, have new dentist, young, bright and female. Get your teeth done in Budapest! And Merc... ever since an especially tricky wisdom tooth extraction when I was a lad, I've come to the realisation that there are few sounds in nature as terrifying as a dentist going "ops". Ah well, life's a gamble. Try this one. Chris has never had a cavity in his entire life because his mother, who was a dentist, would PROACTIVELY drill holes and fill his teeth…just to make sure...when he was a child. Chris has not been to a dentist since I met him, to my knowledge he has never been to a dentist of any kind other than his mother. But just think about the psychological trauma THAT must have caused. That is beautiful in a very strangely normal way. Oh, I don't know, it seems rather strangely strange to me. 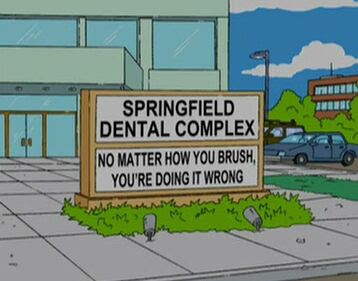 But then I can't bear to think of a world without dentists so I'm always hesitant to criticise them. Because dentists and Mothers care. Combined that's a powerful caring combo. I was never 'taught' anything like that about brushing my teeth ... I think that dental creature was an evangelical kind of dental person and therefore untrustworthy, surely? Maybe so, but since seeing the bill I am now flossing every twenty-five minutes, just to be safe.